Packing is probably one of the most important phases of your move, and we have it down to a science. We offer various ways of packing your belongings from glassware, pictures, mirrors and china to books, linen and cloths. 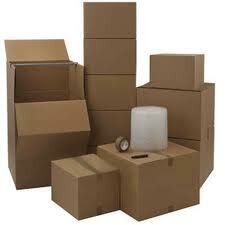 We feature full or partial packing as well as unpacking and the disposal of all empty boxes, according to your budget. As part of the packing process, we offer wrapping tissue paper to cushion and protect your goods. Each box will be labeled by room and content for easy tracking and unpacking. We offer a free box delivery service with a minimum requirement of a $75 purchase and 24 hours notice. Any unused boxes can be returned for a full refund. Please submit an on-line estimate request to obtain pricing information and coupon discounts for packing services and supplies. Full Service Packing – All items in your home are packed by us using the most up-to-date packing methods and materials in the industry. Do It Yourself Packing – A Local Van can provide boxes and materials (see Packing Materials) to make your job as easy as possible. Our packing options let you do as much as you like or as little as you like when it comes to your move. As your household moving company, we wouldn’t have it any other way. Mirror Boxes for paintings, mirrors, etc. Free delivery for orders over $75 within a 30 mile radius. A Local Van Moving and Storage will furnish your moving packing supplies at competitive prices and we also provide packing services. We will make a one-time delivery of boxes and packing supplies free of charge if the price exceeds $75 in total value. We sometimes deliver more boxes than you may need in order to fulfill your needs for different sizes. You pay only for the boxes you use when the unused boxes are returned on move out day. We understand it is difficult to predict exactly how many boxes your move will need before you start the packing process. If there is something else you need and it is not on this list, please contact us at (502) 266-7777 and we will probably be able to get it for you.